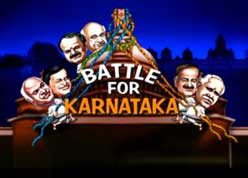 May 25, 2008: We need to move beyond the cliche of recent weeks when the political class and their hangers-on in the media argued that the Karnataka election results would be the ultimate clincher for national politics in coming months. The cliche of a clinching event in politics is only partly true at any time, and like any half-truth, its worth often enough turns out to dubious. But its relevance nonetheless remains unquestionable. First, the Bharatiya Janata Party is not only retaining its popular appeal among the people but it is capable of gaining new ground. It is placing itself to ruthlessly exploit its adversaries' follies and foibles, which is, after all, what politics is about. Electoral success works like an aphrodisiac in pushing to the background -- even if temporarily -- the party's ideological confusion and the manifest disarray of transition in the party's leadership to the post-Vajpayee era. Second, the Congress party has vastly exaggerated its capacity to regenerate its popular appeal. The Karnataka election results show that despite all the backlog of the controversial BJP-Janata Dal-Secular rule, at best it could say its decline in recent years has somewhat slowed down. But that is a far cry from claiming that the party is reversing the decline. Third, the trend continues to run in favour of regional political parties. There is no doubt that parochial identities in Indian politics continue to gain ground in spite of the deplorable performance of the regional parties when they are in power. But there are wider implications of the Karnataka results. What lies ahead? For the BJP, the Karnataka election results come as a tremendous booster of political gravitas. Even its worst detractors will have to admit that much. The party is definitely on a comeback trail in national politics. We can no longer be dismissive of the party's expectations of capturing power in the next parliamentary election as sheer flights of fancy. The BJP can look forward to projecting itself in coming months as a credible alternative to the present dispensation at the national level. For the Congress, the Karnataka election results come as a litmus test of its popular appeal after being in power at the national level for four years. The party's national leadership campaigned actively. It cannot credibly argue at this stage that the Karnataka election results are a flash in the pan stemming from mofussil reactions. The party should have strong reason to estimate that the lacklustre performance of the United Progressive Alliance government, the image of the Manmohan Singh [Images] government having pursued elitist economic policies and the growing economic hardships of the common man -- all these are combining to pose a formidable political challenge. The unfortunate part is that the Congress party has hardly anything to offer that catches the imagination of the electorate. And there are serious limits to encashing populist measures in the run-up to elections at the time of elections. The Indian electorate is, simply put, getting savvier by the day. The Congress party has important decisions to make. All indications are that the inflation index, which is actually in double digits in real terms already for the Indian consumer, is poised to go up further. Life for the common man is going to be even harsher in the coming months as consumer prices go up following an almost inevitable rise in petrol prices. The Congress party inherits the political legacy of the hard times lying ahead. There is no reason to believe that the political ground can be significantly retrieved in the months ahead. On the other hand, further erosion of the Congress party's popularity becomes a real possibility. Second, the loss of Karnataka to the BJP makes it imperative for the Congress party to reverse the tables in the forthcoming elections in Madhya Pradesh, Rajasthan and Delhi. Yet, nothing is certain in electoral politics. If the Congress party doesn't capture power in at least one of the BJP-run states (and retain power in Delhi), that creates another political legacy of grave negative proportions that could turn out to be overwhelming as it edges closer to the national election. Ironically, the Congress party's virtual certainty to capture new political ground lies in the states of Kerala and West Bengal where it hopes to make inroads into the Left parties' tallies in the 2004 election. In political terms, the Congress party's capacity to hurt the electoral prospects of the Left parties has increased following the elections to the local bodies in West Bengal. Again, by drawing the Samajwadi Party to its side, the Congress is certainly insuring itself against political isolation from a Third Front led by the Left parties and at the same time keep its UPA flock together. In fact, the dilemma facing the Left parties become acute as they are forced to abandon the residual pretensions of a Third Front, which they have been quite vocal about up until most recently. On the one hand, the impending Congress-Samajwadi Party realignment significantly diminishes the capacity of the Left Parties to bargain with the UPA government. On the other hand, in any future sharing of power at the Centre led by the Congress party after the next general election, the clout of the Left parties would be somewhat curtailed. It is an interesting thought for the Left parties, which mastered coalition politics far ahead of any other party, whether the Congress leadership actually worked towards this end or things simply took a momentum of their own. On the other hand, it is the Left parties, which now get haunted by the spectre of political isolation, as the 2009 election draw closer by the day. The dissipation of the cloud of a Third Front formation immensely helps the BJP to shore up and revive another NDA (National Democratic Alliance)-like alliance led by it. Conceivably, even N Chandrababu Naidu [Images] may now begin to feel the urge to find a habitation and a name within such an alliance or in tandem with it. He should by now know that a Third Front idea is taking him nowhere. Naidu, in fact, has to face the reality that he has no place to turn in national politics other than a BJP-led alliance, as his dalliance with the Left parties face severe limitations of ideology and class interests. In other words, the BJP is in all likelihood in the process of revitalising its NDA alliance. This is the case not only in south India, but nationally. The BJP is bouncing back with gusto into mainstream party politics after the years of drift and alienation. The Congress bosses have to do some quick rethink in the coming days. They may have to estimate whether if the national elections are held along with the forthcoming state elections, there could be any particular advantage. Conceivably, the Congress should hope to garner whatever advantages it might have in electoral strength in these states (Madhya Pradesh, Rajasthan and Delhi), while avoiding the debilitating damage that is sure to be inflicted on its standing if, on the contrary, it fails to capture power in these states. At the same time, the Congress bosses will have to weigh in that the later the national election is held, the more likely that the Congress and the UPA would lose ground to the BJP. It is a foregone conclusion that rising inflation threatens the UPA's political fortunes. There is no quick fix to arrest the incremental erosion in the UPA's popularity that seems almost unavoidable as time passes. The Karnataka election results may, therefore, hold an important message for the Congress: Should it cut and run for the national election as quickly as possible? However, the dilemma facing the Congress bosses will be acute. It is always a difficult decision for a political party to make in any democratically ruled country to abdicate power when it is safely ensconced in government for almost another full year ahead and while the gravy train is still running in top gear. The more time in power means the greater accretion of wealth in the Congress party's war chests, the more opportunities to extend patronage and largesse and thereby to keep the UPA flock together, and to cultivate new interest groups. Most important, time is needed to transform the incipient proximity with the Samajwadi Party into an optimal electoral understanding. Least of all, the Congress leadership may sincerely have the need of valuable time to allow its new blood to gather experience in the rough and tumble of Indian politics.